The controversial ‘gas tax’ is benefiting Long Beach, but for how long? A vital stream of revenue, more than $10 million last year, has helped Long Beach shrink a backlog of road maintenance projects—but that pot of money is at risk of being jettisoned by a statewide vote in November. The new funding comes courtesy of the controversial Senate Bill 1, more commonly referred to the “gas tax,” which was passed by the State Legislature and signed into law by Gov. Jerry Brown last year. It raised excise taxes on regular and diesel gasoline by 12 cents and 20 cents, respectively, and added fees for zero-emission vehicles ($100) and vehicle registration fees that range from $25 to $175 depending on the value of the vehicle. The bill is projected to generate about $52 billion over the next decade, half of which is earmarked for local roads and transit agencies. In May, Metro announced it would receive $703 million in SB-1 funding. To date, Long Beach has received or applied for about $10.7 million in the first year and a half of the tax, with about $8 million of that set to fund projects in the coming fiscal year. 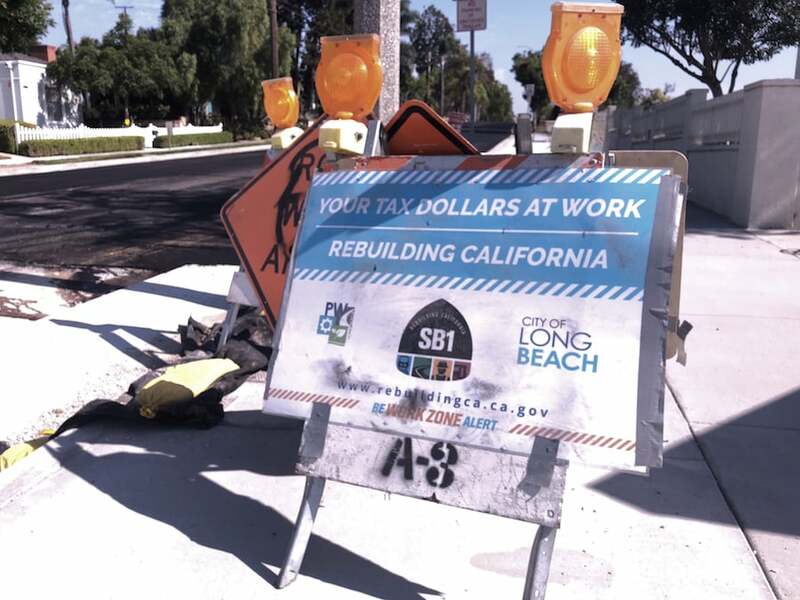 Long Beach Director of Public Works Craig Beck said that he’s hopeful the city’s allocation of SB-1 funding will increase as the years go on, stating that he’d like to see it get to $10 million and possibly $15 million per year. The state money would not go toward projects targeted by the city’s own infrastructure tax measure, Measure A, a voter approved one cent sales-tax increase passed in 2016 that is estimated to bring in tens of millions of dollars for the city over the next decade. Beck was referring to the Repeal the Gas Tax group’s effort to kill SB-1 at the ballot box in November. The group gathered millions of signatures and qualified the effort for a statewide vote, that if passed, would strip the state and cities like Long Beach of funding to fix roads, highways and other infrastructure. Carl DeMaio, a San Diego talk radio host and chairman of Reform California, said that the Yes on 6 campaign is not only seeking to stop SB-1 taxation, but also implement its own replacement bill that would require transparent spending of future gas tax revenue to ensure that it’s being spent on infrastructure. He referenced a release from Sen. John Moorlach, who represents Orange County, to support his claim that the state has been diverting transportation funding to other line-items in the state’s budget. DeMaio contends that there is enough funding under the state’s pre-SB-1 gas tax fund to address infrastructure needs. Matt Rocco, a spokesman for CalTrans, said that while SB-1 does double the funding for transportation improvements statewide, the state, like Long Beach, has a long backlog of projects that have been piling up and getting more expensive. Rocco said the state has about $130 million worth of work in its backlog, a sum that will only grow if roads, highways, bridges and other state infrastructure continue to go without proper maintenance. If SB-1 is repealed, that could create major issues for agencies that are relying on its revenue to prop up ongoing transportation expenditures. SB-1 is funding a rehab of a 99-mile stretch of Pacific Coast Highway that runs from the Los Angeles-Orange County Line to south Santa Monica, a project with a price tag of nearly $55 million. Portions of the money granted to Metro will go toward enhancing trade corridors like entries to the Port of Long Beach and the 710 Freeway. The tax’s $5.4 billion is divided up between state and local municipalities, with the state’s focus being pavement, bridges, drainage projects and traffic management elements like ramp meters and traffic censors Rocco said. When local SB-1 funding makes its way to cities, they have the freedom to identify which parts of their public infrastructure they want to focus on. Thus far, Long Beach has zeroed in on streets. With its application for $8 million in SB-1 funding for this fiscal year, Long Beach could service about 6 miles of roadways in the city. That is combined with the smaller projects it carried out in the latter part of the previous fiscal year where stretches of six streets, mostly in East Long Beach, were serviced. Beck said that when the city works on a street, it takes a “complete streets” approach, meaning that not only the lanes are improved but so are the sidewalks, bike paths and curbs. Under the first two years of Measure A, the city has allocated about $31 million to repairing roads and has identified another $8.5 million in this year’s proposed budget to repair more residential streets, sidewalks and curbs. Beck said that to truly address the city’s backlog of work Long Beach would need about $50 million a year, but he’s hopeful that if SB-1 continues past the November election that Long Beach can steadily grow its share of SB-1 dollars to continue to supplement its other funding for infrastructure repairs.